Yankel Ginzburg - Zimmerman Editions, Ltd.
secret to him until the age of 9. The family immigrated to Israel in 1957 where Yankel began his career in art as the youngest student ever accepted to the prestigious Institute of Art. In 1968, after graduating with honors, two years of service in the Israeli army, and several art awards and one man shows in Israel and Italy, Yankel arrived in the United States for his first U.S. solo exhibition sponsored jointly by the Israeli Ambassador to the United States, Yitzhak Rabin and First Lady, Lady Bird Johnson at The National Gallery of Art, Washington, D.C. Since his arrival in this country, Ginzburg has had at least one important one-man show in major cities each year, spreading his art from coast-to-coast, throughout Europe, the Middle East, and the Far East. The winner of the coveted Silver Medal in the Rome Biennale, and the subject of a full-length documentary art film, numerous books, and published articles, Yankel Ginzburg has been productive in a variety of creative media-paintings in oils and acrylics, tapestries, serigraphs, and his famous quadri-dimensional acrylic serigraphic sculptures. 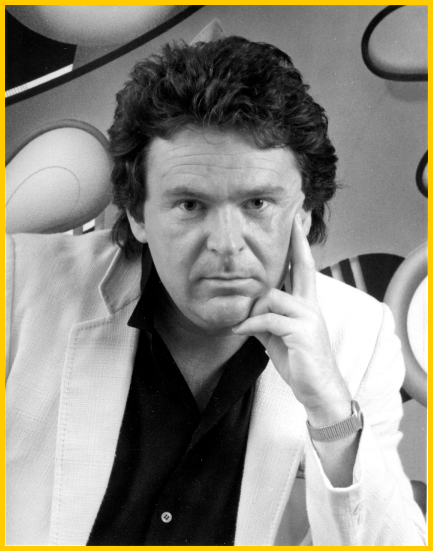 Zimmerman Editions Ltd. was his art publisher and exclusive serigrapher during Mr. Ginzburg’s most active years of creating serigraphic limited edition sculptures and prints, from 1979-1996. Yankel Ginzburg: A leading contemporary American painter and printmaker, Yankel Ginzburg came to New York at a young age. His first published prints date from 1970. Most of his earlier art is in the medium of lithography. By 1980, however, Yankel Ginzburg had turned almost completely to the medium of the silk-screen, finding it to be the most suitable method to shape the solid forms and colours which have characterized his art. Art scholars have termed Ginzburg’s large and impressive silk-screen prints as both ‘post cubist’ and ‘constructivist’. 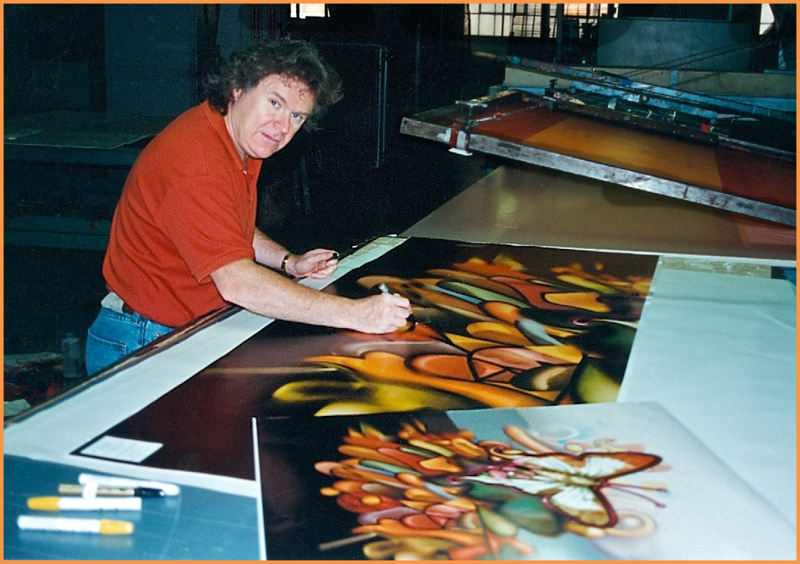 Yankel Ginzburg’s art has been included in many major national and international exhibitions. He has also been featured in one man shows in both New York and Washington. Life in the Fast Lane is one of the artist’s largest and most highly respected works of original silk-screen art. Released: City in Blue mixed media serigraph, published and printed by Zimmerman Editions, Ltd., atelier. Commissioned by President Reagan to create the official poster for the Air and Space Bicentennial. One-man shows in Philadelphia, Washington, D.C. and Los Angeles galleries. Celebrates the birth of his son, Aviel. Meets the artist Peter Max. Art book published by Alef Editions, The Art of Yankel Ginzburg. Commissioned to design three graphics commemorating the Bicentennial of the Constitution. Contemporary Masters Calendar published by Simon and Schuster, Inc. Commissioned to create the monumental sculpture titled “Invisible Hands”, Tampa, Florida. Artwork appears on cover of Study Guide to Accompany Introduction to Psychology. Released: Celebrating the Constitution Suite honoring the 200th anniversary of the United States Constitution. Suite consists of three serigraphs: “Birth of a Nation”, “Glorious Document”, and “Celebration”, all printed by Zimmerman Editions, Ltd. Released: Serigraphs “Tea in the Afternoon”, “Twilight in My Garden”, and “Summer Heat Wave” all three serigraphically printed at the Zimmerman atelier. Released: “Rhapsody In Blue”, artist’s largest mixed media edition print. Released: “Summer Heat Wave” Calendar at 10th Annual Art Expo NY and this serigraphic calendar wins SPAI International Silver Quality Award. Serigraph “Tea in the Afternoon” wins SPAI International Bronze Quality Award. “Rhapsody In Blue”, “Summer Heat Wave” Calendar and “Tea in the Afternoon” were each printed in Baltimore, Maryland USA by Zimmerman Editions, Ltd.
Signs a formal exclusive agreement with Dyansen for worldwide representation. Invited by director Robert Altman to play himself in the movie Tanner 88. Released: “Mood Swing”, “Breeze”, “Chasing the Star”, “Garden of My Delights”, “Deep Waters”, “Flowering”, “Reflecting Worlds”… each acrylic serigraphic sculpture limited edition produced by Zimmerman Editions, Ltd.
Serigraphic poster “Summer Heat Wave” Calendar wins Best of Category at annual PIM+SP Awards quality competition, printed by Zimmerman Editions, Ltd. Released: sculptures “Poet’s Heart”, and “Column Rotunda” the world’s first movable cylindrical sculpture edition, produced by Zimmerman Editions, Ltd. Released: “Vibrations”, “Reflections” and “Santa Fe” serigraphs printed by Zimmerman. Invited by the Soviet Union to exhibit in Moscow. Meets with President Mikhail Gorbachev and Minister of Culture Nikolai Gobenko. Urges the Soviets to give him an SS-20 missile for a monumental art project. Establishes The Fund for Democracy and Development; Richard Nixon, Honorary Chairman. Released: “Fanciful” serigraphic sculpture edition, first with whimsical facial image, produced by Zimmerman Editions, Ltd. Released: “Inner Light”, and “Musical Fantasy” the first serigraphic edition to be produced, in part, on 10mm thick board, printed by Zimmerman Editions, Ltd.
“Santa Fe” serigraph wins PIM Award of Merit. 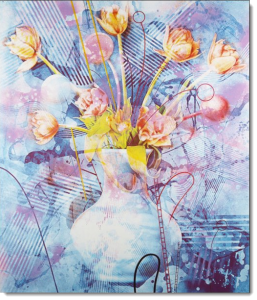 “Rhapsody In Blue” wins Printing Industry of America Award of Merit—Art Prints, and also wins Gold Award in prestigious P&PE Quality Award U.S. Competition, receiving national press coverage on artist and Zimmerman Editions, Ltd. Delivers 41,000 lbs. of food to U.S.S.R. for needy cities of Moscow and Kalinin. Honored by Shirley MacLaine, Senator George McGovern, Lauren Bacall, Arthur Schlesinger and Ambassador Viktor Komplektov of the Soviet Union for his efforts on behalf of the people of Russia. Commissioned to create a summit gift to be presented to Russian President Boris Yeltsin by U.S. President George Bush. Embarks on a mission to the Soviet Union, meets with Minister Gobenko on behalf of the Lubavitch movement to secure the release of their Holy Books. Honored by President Boris Yeltsin and the Supreme Soviet of the Russian Federation with a Humanitarian Honor Award First Class. Released: “Shred of Moon”, and “Emerging” the tallest and largest of all sculpture editions created to date. Produced by Zimmerman Editions, Ltd., atelier. Released: “Begin To Begin”, “Six Days”, and “Carousel” serigraphs, limited editions printed on paper with some proofs printed directly on board by Zimmerman Editions, Ltd.
Award: “Begin To Begin” serigraph wins Bronze in international SPAI competition. Ginzburg: The Russian Collection, published by Russian Academy of Arts. Nominated for Horatio Alger award. One-man show, Bronte Contemporary Arts, Boston, MA. One-man show at the Kaplan Art Center, West Palm Beach, Florida. One-man show, Art Academy, Moscow. Hosted dinner in honor of Foreign Minister Andrei Kozyrev of the Russian Federation. Released: “Evening Dress” and “Evening Carousel” paper and board, printed by Zimmerman Editions, Ltd., atelier. “Begin To Begin” serigraph wins top Best of Category – Fine Art Serigraphs at the PIM+SP Print Quality Award Competition. Presented award from Ambassador Vladimir Lukin of the Russian Federation in appreciation for his help and friendship to the people of Russia as an individual and as founder of The Fund for Democracy and Development. Meets with Prime Minister Viktor S. Chernomyrdrin of the Russian Federation. Meets with President Bill Clinton and updates him on his involvement with the Russian Federation. Invited to participate in historic peace agreement between Israel and the Palestinians. Meets Chairman Yassar Arafat of the P.L.O. One-man show at the Landmark in Hong Kong. His fund, The Fund for Democracy and Development, surpasses its goal providing $240 million in aid to the former Soviet Republics. Released: Mezuzah 1994 sculpture edition produced at Zimmerman Editions, Ltd. Released: The Art and Life of Yankel Ginzburg, through Vincent Lee Publishing. Released: “Killington Gondola Butterfly” an edition of permanent vinyl and Contra Vision graphics serigraphed to beautify body and windows of a series of new cable cars (gondolas) for ski resort. Printed and fabricated by Zimmerman Editions, Ltd. and installed in Switzerland, then transported to Vermont. 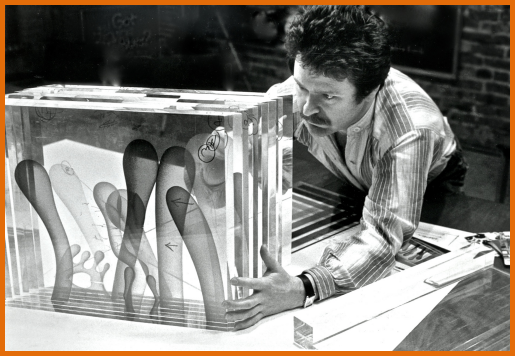 See photo below of Ginzburg preparing the graphics for the Killington Gondola Butterfly at the Studios of Zimmerman Editions. Unveiling of the Ginzburg Gondolas at the Whitney Museum, New York, NY. Award: “Carousel” serigraph wins top quality award in PIM+SP competition. One-man show, Vincent Lee Fine Arts, Hong Kong. Joins The International Jewish Fund for Disaster Relief (serves as the 1stVP). Creates a series of paintings based on his impressions from Asian travels. Ginzburg Multigraph Book, published by Print Studio, U.S.A. Introduces a new series of watercolors. One-man show, Lahaina Galleries, Hawaii. Recognized by President Bill Clinton for his contributions in Art. Honored at the Vincent Lee Fine Arts Charity Art Gala, Hong Kong. One-man show in Hawaii, Vancouver and Hong Kong Galleries. Honored again at the Vincent Lee Fine Arts Charity Art Gala, Hong Kong. Creates working maquette for commissioned monumental sculpture commemorating the reunification of Hong Kong and China. Commissioned by His Imperial Majesty Reza Shah II to create an objet d’art humidor capturing the majestic beauty of The Royal Peacock Throne. Celebrates Bar Mitzvah of his son, Aviel. Feature article Smoke Magazine, Summer Issue. Unveiling of Ginzburg objet d’art humidors sponsored by Variety Magazine. Designed cover of book by Herman Taube titled Golden Leaves. Featured in book Upon Thy Doorstep by Belle Rosenbaum. Designed cover of Gold Cup Magazine. Featured article in Gold Cup Magazine. Feature article in Israel: 50 Years On…, commemorative issue. Instrumental in establishing the Mihan Foundation, a non-profit organization dedicated to creating a greater understanding between the United States and the people of Iran. Artist’s father, Itzhak Ginzburg, passes away at the age of 80. To commemorate his father’s death, designs a CD cover for Shabbat with Spirit, an original assemblage of religious music compiled by Cantor Arnold Saltzman. Feature interview in Leaders Magazine. Recognized at the Global Peace and Tolerance Lifetime Achievement Awards. Designs the official Lifetime Achievement Awards for the United Nations. Designs the official banner commemorating the Day of Tolerance. One-man show at Jordan Road Gallery in Sedona, Arizona. Feature article in the Georgetowner. Mentioned in the book Living the American Dream, by Henry L. Kimelman. Exhibits at Collection Privée de Peinture et de Sculpture, Miami, Florida. Creates special commission for athlete Michael Jordan. Feature article in Cigar Flavor Magazine, Israel. Creates a special exhibit for Gala co-hosted by Football Hall of Famer Ronnie Lott, benefiting various California Children Charities. Hosted Brandeis University Function, Washington Chapter, in his residence. Feather article in Itzuv Habait, The Magazine for House Design, Israel. Won a special commendation award for his ski gondola design, which is on display at Killington, Vermont. Cover story for Lifestyles Magazine, “Yankel Ginzburg—The Message Is In The Colors”, International Summer Edition. Created art installation for: College Misericordia Museum in Dallas, PA, Strathmore Hall, Bethesda, MD and Southeast Missouri State University Museum, Cape Girardeau, MO. Mural installation at the JCC Jewish Community Center of Greater Washington. Feature article in Leaders Magazine. Created sculpture titled Celebration for the unveiling of the 2000 vintage of Oasis champagne. Feature article in Israeli Magazine. Unveiling of a new water feature concept. Premiere of Water Fantasy, a documentary featuring various water sculptures. Installation of art at Vanderbilt University, Nashville, TN. Subject of documentary movie by Flike titled Ladders which was narrated by Harry Belafonte and nationally televised. Designed and produced a series of six music boxes dedicated to history’s greatest composers and music performers. Hosted Society for the Arts – Patrons Event benefiting the JCC Jewish Community Center Cultural Arts Program in his residence. One-man show – Lahaina Gallery Ladders released on DVD.